Yai-Bua needed a better life - and new footage perfectly captures the moment she finally got it. 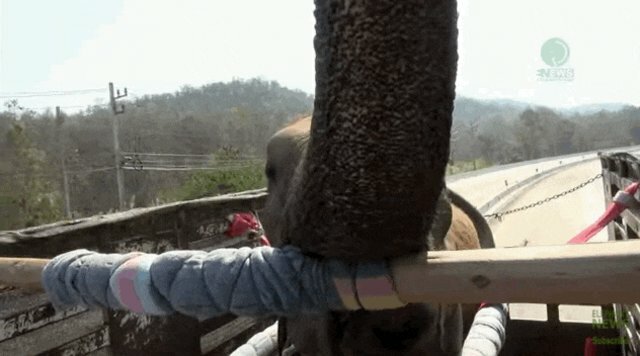 She'd been forced to give elephant rides to tourists in Thailand all day long for years. In her 60s, Yai-Bua was tired and suffering. She had an abscess on her leg. One of her feet was so worn down she couldn't put much weight on it. And she was also suffering less visible injuries - Yai-Bua had given birth to five babies throughout her life, and each one of them passed away. Finally, everyone agreed she needed a change - even Yai-Bua. In February, when the touring company allowed rescuers from Elephant Nature Park (ENP) - a sanctuary for worn-out elephants like Yai-Bua - to come and drive Yai-Bua to her new home, she walked right onto the truck and started eating. Yai-Bua lifted her trunk high in the air as they sped away. She was so ready to go. Click here to learn how you can help the elephants at ENP. Click here to learn about the dark side of elephant rides.